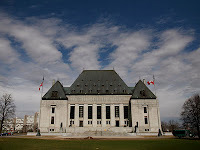 Justice Moldaver and Justice Karakatsanis are both highly intelligent, greatly experienced and eminently qualified for their new roles as Supreme Court justices...I have every confidence both justices will serve all Canadians faithfully and with distinction. These appointments also mark the loss of Madam Justice Louise Charron and Mr Justice Ian Binnie. Any change to the Supreme Court is a significant one, but this change is particularly notable as it marks the loss of one criminal law luminary and the gain of another. Justice Charron has been a powerful force on the Court for the last several years. She has authored some of the most significant decisions of the past decade and drafted reasons that will be cited for decades to come. Her writing style is clear and her legal analysis is second to none. A short list of some of the most notable decisions make the point: R v Nixon, 2011 SCC 34; R v Sinclair, 2010 SCC 35; R v Pickton, 2010 SCC 32; R v Suberu, 2009 SCC 33 (see my article on Suberu: A Death on the Way to Rome); R v Grant, 2009 SCC 32; and R v Dinardo, 2008 SCC 24. Justice Moldaver has similarly been a powerful force at the Ontario Court of Appeal. His decisions are legally sound and logical and he is certain not afraid to disagree with his colleagues and stand by his decisions. A shot list of some of his recent rulings illustrate this point: R v Woodward, 2011 ONCA 610 (see my Bulletin comment on this case in MCLB Issue 8: Sentencing: Internet Luring); R v Sarrazin, 2010 ONCA 577 (in which he wrote a brilliant dissent, now being considered by the Supreme Court; see my Bulletin comment on Sarrazin Issue 1: The Curative Proviso); R v Phillion, 2009 ONCA 202; and Re Truscott, 2007 ONCA 575 [Moldaver J was part of the panel for the per curiam decision].